Mangore | Bellucci Guitars - Bryan Adams, "Have You Ever Really Loved a Woman"
Here is Bryan Adams' soundtrack from the movie "Juan de Marco". 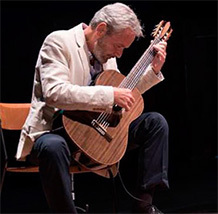 In the recording the Canadian composer asked the legendary Flamenco player Paco de Lucia to play some Flamenco scales to add an unforgettable flavor to a great song. It must have been these amazing Flamenco "touches" very present during the piece that have made this one of my all time favorite songs. The Canadian composer is without any doubt a gifted musician and composer with an aesthetical presence that has brought to life some of the greatest songs my generation has ever known. The 2 flats, B and E add the amazing flavor to the piece and give it a seal that makes it recognizable after only a few notes and this is the mark of a true classic designed for the ages. Open strings offer a breath of fresh air to the classical guitarist because the guitar only offers 6 possibilities to produce sound using one hand alone. These opportunities ought to be taken advantage of fully. Renato Bellucci plays "Have You Ever Really...""
San Bernardino, Paraguay, January 8, 2015, S.D.G.